My son woke me this morning and because asking me when we will continue going through my things. He found some hidden treasure while I was clearing things and opening different drawers in the house. 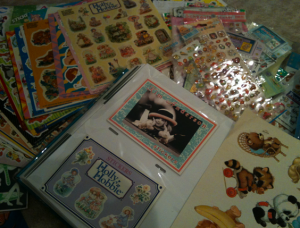 As we were opening drawers we came across my old sticker collection, which I have been hiding for a while. His eyes glittered with excitement and he looked through it before asking and selected his few favorite. I regretted introducing him to the concept, as I still collect them and often would buy a few for him. I told him that I have been collecting them from a very young age and that I wanted to also preserve them for his brother and future siblings. The whole reason I collected them, in the first place, was so that one day my children would look at them in appreciation. We both smiled and embraced the moment.